"Lord Orrery's Travels in Kerry, 1735", by The Knight of Glin, in Journal of the KAHS no.5, 1972. 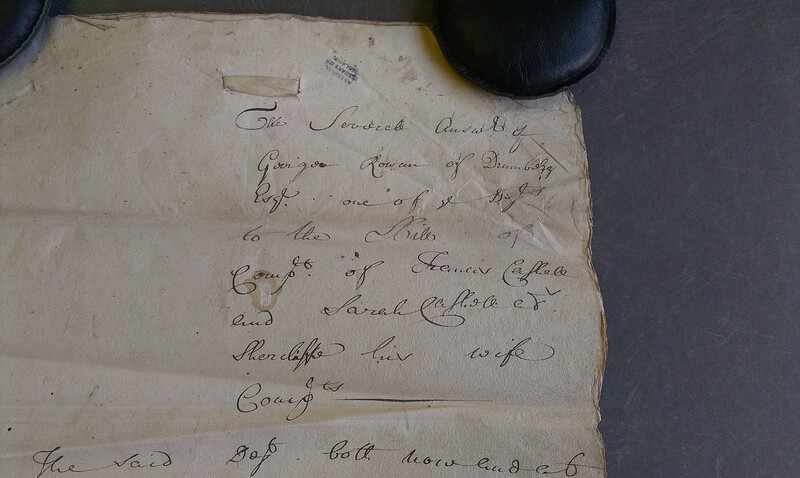 Cover of the "Cashell v. Rowan" document dated 1729, found in Ms 20610 in [Rowan Papers]. Shows Francis Cashell and his wife Sarah, widow of William Sheircliffe. incorrectly listed as "George" in "Black Jack's Book", see p.39 of [Hickson, 1872]. He was apparently educ at TCD, prob. BA 1719. He mar c.1727-29 to Sarah Rowan [of Droumbegg, Co.Kerry, born est c.1702, descendant of Edward III, her mother was a Blennerhassett]. Think the Cashells only came to Co.Kerry through this marriage. See "Cashell v. Rowan, 1729" in Ms 20610 in [Rowan Papers]. He is "Francis Cashell", Deputy Clerk of the Crown, mentioned in the trial of the Danish Silver Robbery 1731. See [Hickson, 1874]. Hickson also lists him as "Francis Cashel", Deputy Clerk of the Peace. Hickson is wrong to think he is the brother of "George" who married Rowan. Francis Cashel, Deputy Clerk of the Peace, certified the indictment of Thomas Hickson of Gowlane, who "seems to have conformed to Protestantism, to qualify himself probably for the appointment of Seneschal of the barony, which he held, but having betrayed his trust he was indicted under the name of Thomas Mac Robert Hickson of Gowlane for harbouring Tories and Papists". See "Hicksons of Fermoyle, Genealogical Notices" in [O'Kief, vol.5, p.455]. He must be "Francis Cashel" who subscribed to the book The Doctrine of Projectiles demonstrated and applied to all the most useful problems in practical gunnery, William Starrat, Dublin, 1733. He or his son may be "Francis Cashell", of Tralee, gent, admitted 1754 as [Freeman of Fethard]. He or his son may be "Francis Cashell", lieutenant in the Kerry militia temp 1756, in a regiment of foot under Col. John Blennerhassett. See [Ó Snodaigh, 1971]. must be after grandmother Mary Blennerhassett. family name since grandmother's mother Ruth Blennerhassett. [O'Connor, 1816] says 1st Baron Ventry was cousin-german (1st cousin) of him (Rowan's father). He is probably Henry of Bushfield, Co.Tipperary below. [source is [Ms 4112], but this might simply be a duplicate of Francis father of George of Tralee above]. This Henry must be the same as the following, given the connections to Ballynevan, White and Greenhall. 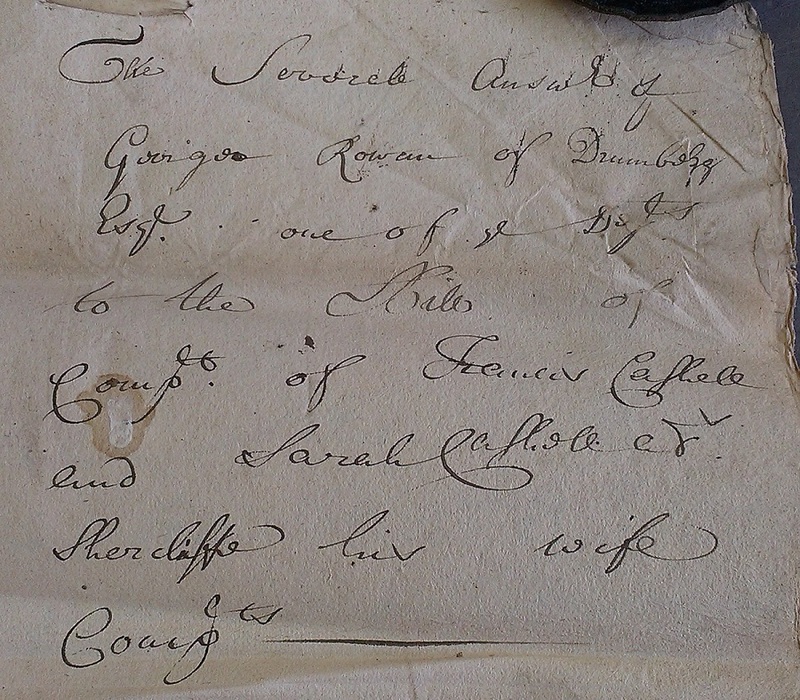 for marriage of George Head, Gent., of Kilboy, Co. Tipperary [must be Kilboy, Kilmore par, NE of Silvermines], and Sarah White, Spinster [must be relation of our Henry's wife Rebecca White], of Greenhall, Co. Tipperary [just W of Shallee, later the residence of our Henry's son Benjamin, who must have inherited through his mother]. Douglas Cashel, of the Bushfield branch, born 1840 or 1841, worked there at least 1869 to 1901. Richard Cashel, of the "Uniacke Cashel" branch, born 1841, worked there at least 1884 to 1886. Arthur Cashel, of the "Rowan Cashel" branch, born 1859, worked there as at 1901. All 3 said to be cousins of each other, but not proved. Both Arthur Cashel and Douglas Cashel's son Sidney C. Cashel are found living at the same address, 11 Kenilworth Square, Rathgar, Dublin, in 1901. Supposed to be cousins (see above). died 1877, Dublin North, age less than 1 yr, (todo) see [GROI] entry, vol.2 p.417. admin of estate granted 12th Apr 1917, Dublin, to his mother, admin survives in [NAI]. admin of estate granted 24th Oct 1928 at Dublin to brother Frederick [NAI]. he died 18th Nov 1953, Annadale, Greystones, Co.Wicklow, age 69 yrs [GROI].